Fife Herald, 10 January 1839, p.2 col.5 (pdf image). At the end of a report of a meeting of one of the “Radical Associations” (Chartist Associations) of Fife, a copy of Emigration Fields is presented. At this time (January to April 1839), Matthew was the elected Delegate for Perthshire and Fifeshire to the Chartist National Convention, and he saw emigration as another way (other than Universal Suffrage) for alleviating the condition of the British working class. Thomas Shepherd also laid on the table a copy of Mr Matthew’s work, entitled “Emigration Fields,” presented by the author, and announced that he had received a few copies for distribution among the different Reform Associations in this part of Fife. A vote of thanks was returned to Mr Matthew for the present of his book, which is valuable from the information it contains regarding the comparative advantages which the different British colonies hold out to intending emigrants. 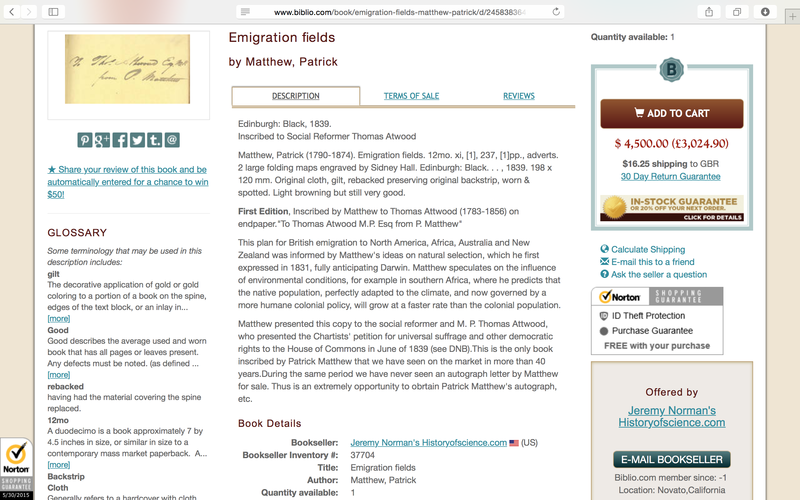 Emigration Fields, copy presented to Thomas Attwood (screenshot). This is a copy of Emigration Fields that Matthew presented to Thomas Attwood, the Member of Parliament who campaigned for the Reform Act of 1832 and who presented the Chartist National Petition to Parliament in May 1839. The inscription on the endpaper reads: “To Thomas Attwood M.P. Esq from P. Matthew”. Perthshire Courier, 12 September 1839, p.3 col.2 (pdf image). Towards the end of a report of a meeting of the “Town Council”, a letter from Patrick Matthew is presented. See Matthew Family Records > Kinnaird Letters > Matthew (1839-08-21) for the original letter, which makes clear that copies of both Emigration Fields and the Scots New Zealand Land Company Prospectus were also enclosed. Matthew requests that the Civic Authorities of Perth publicly endorse his Scots New Zealand Land Company. They decline. NEW ZEALAND SPEC. – A letter from Patrick Matthew, Esq. of Gourdie Hill, soliciting the patronage of the Council to an association, called “the Scots New Zealand Land Company,” for the purpose of encouraging emigration. The Council declined interfering.